Charred lemon wheel and charred pineapple wedge. 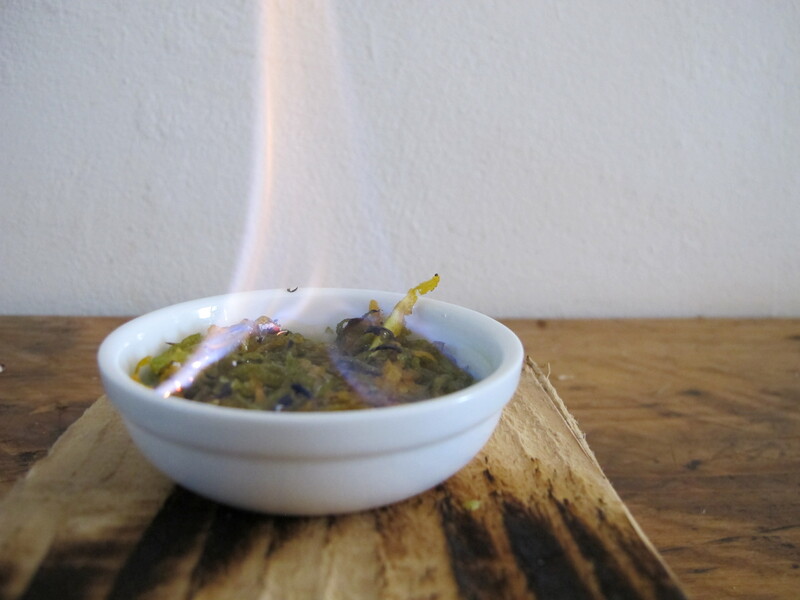 Now this one needs a bit of preparations to do..Place the orange and lime peel, vanilla extract and absinthe in a little pot and set on fire, just like this. 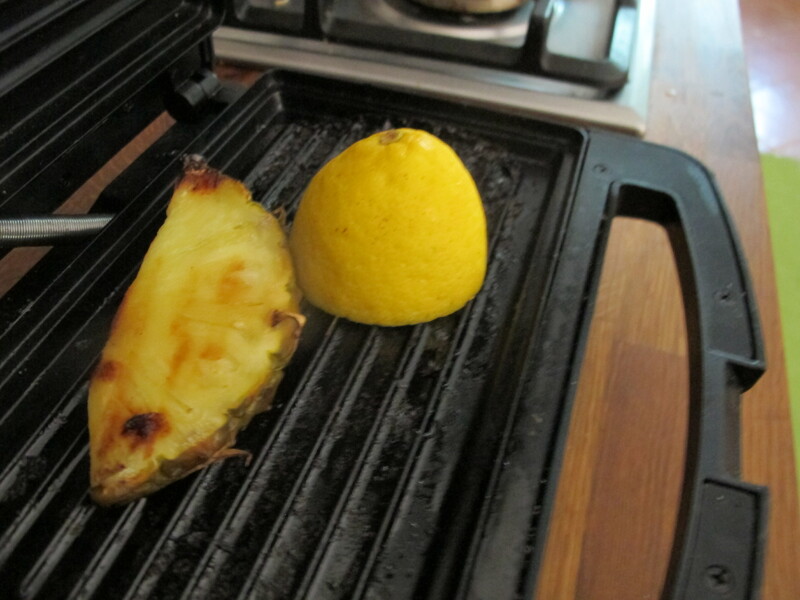 To prepare the grilled lemon and the grilled pineapple juice, just put few pieces of fruit on the grill, and cook them for quite a while, until they both become caramelized, aka brown. Put pieces of each fruit in a juicer and extract the liquid, then let them cool for a bit. Save some of the grilled fruit for garnish. Burnt sugar syrup is quite simple to make, I used instructions from “Craft Cocktails at Home” by Kevin Liu, but I’m sure you can find a recipe on his website as well. Once you have all the ingredients ready, chuck them all except the bitters in a shaker, dry-shake first and then shake the hell out of it with ice, pour over a couple of big chunks of ice, add 2 dashes of creole bitters and garnish with grilled fruit. 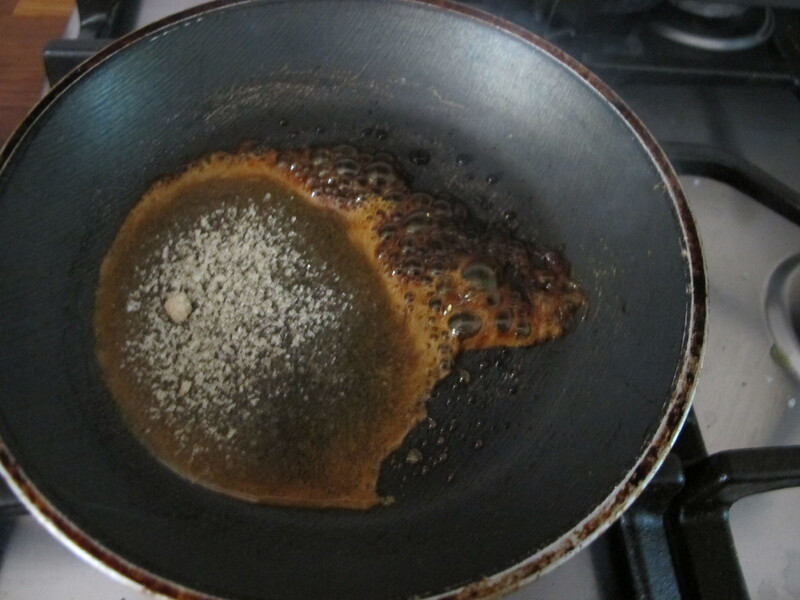 Since the grilled fruit doesn’t come out of the pan really charred unless I leave it there for hours, I decided to blacken them with my portable burner, it adds loads of aroma. 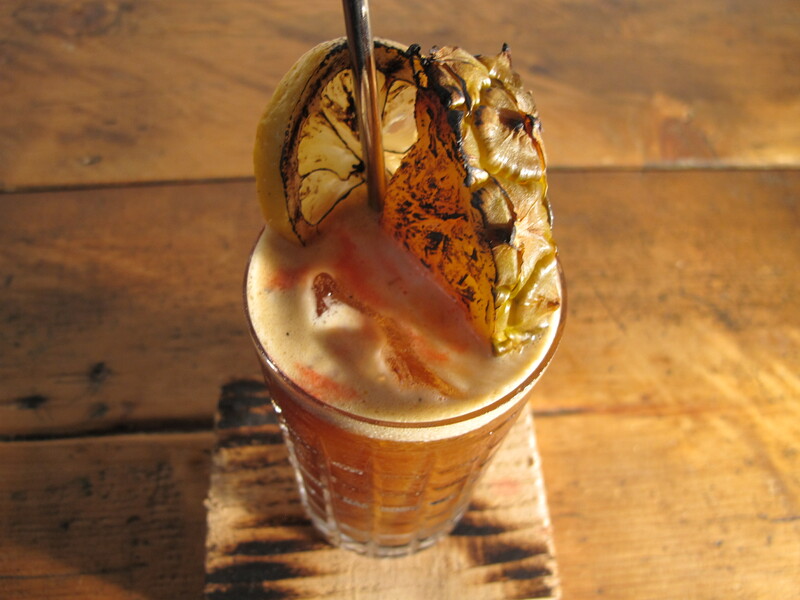 I have been playing with grilled fruit juices for quite a while now, as I’ve tried to incorporate them for a couple of competitions recipes, and I got to say that I love them. They add so much more complexity, especially sour fruits, they mellow and get a much sweeter note. I decided to take this month theme, and rather than using fire as a garnish, I preferred to use ingredients modified by fire. The combination pineapple and absinthe is always a great one in my opinion, as the two flavors compliment each other, but what sets this drink apart is the burnt sugar syrup. It gives a great long lasting sensation of caramel, which ends up mixing with citrus peel and vanilla. This drink has a very complex flavor profile, but it’s incredibly easy drinking. Not a thirst-quencher but a good sour, with extra spices and flavor. That’s all for this one, I had a great time with this theme and thanx again to Muse of Doom for hosting MxMo this month, and also a virtual high-five to Fred Yarm for keeping this great happening alive!! Coming up in the next two weeks, a couple of recipes I am working on at the moment, for Angostura Global Cocktail Challenge 2014, Beefeater comp and Nikka Perfect Serve 2013. You really took the fire theme to heart, Raffaele! I can only imagine how it enhances the complexity of every ingredient to the final result. The anise in the absinthe and creole bitters seems like it would add a nice world-weary quality too. Also, *blush* you’re too kind! Whatever talent I possess could surely stand plenty of refinement yet, I’m sure. Good luck in your competitions! Katie, thank you so much for the theme and for all the effort, if you got time try the drink out,.. it’s definitely something else, and don’t be too modest either, you are really a source of inspiration! Hey Kevin, thanx for all the infos, I really like ur book, great job!!! it kept good company on my recent vacations!